Australian police have confirmed three people, including the hostage-taker, were killed during a day-long standoff at a Sydney cafe. The siege ended around 2 a.m. local time Tuesday when heavily-armed police stormed the shop where New South Wales Police Commissioner Andrew Scipione said a gunman held 17 people hostage for about 16 hours. New South Wales police called the attack an “isolated incident” by 50-year-old Iranian immigrant Man Haron Monis. A 34-year-old man and 38-year-old woman were also killed. The police commissioner said gunfire was exchanged when police raided the cafe, but would not confirm the causes of the three deaths. Prime Minister Tony Abbott said Monis was politically motivated, calling him mentally unstable. He said Monis was well known to law enforcement. Abbott also said the way police handled the situation should leave Australians reassured. Four hostages and a police officer are being treated for non-life-threatening injuries. The takeover of the Lindt chocolate cafe in Sydney’s central business district began around 9:45 a.m. local time on Monday. Five people escaped the cafe on Monday and another five early Tuesday, just before the police assault. At least three more fled with help from emergency workers. A barrage of gunfire and flashes could be heard as security forces in tactical gear surrounded, then entered the storefront early Tuesday morning, local time. A police spokeswoman said the attacker made contact during the siege, but negotiators had not been able to establish a motive for his action. At times throughout the standoff, hostages inside were seen standing with their hands pushed up against the windows. A black flag with the Islamic creed known as the Shahada written in white could be seen through the glass. Man Haron Monis came into the public eye earlier with a letter campaign to the families of Australian troops killed in Afghanistan in which he criticized the soldiers’ actions. The Sydney resident entered the country in 1996 seeking political asylum. He was out on bail after charges related to the 2013 killing of his ex-wife and the sexual assault of a woman earlier this year. “This is a country that’s been on heightened alert for fear of domestic Islamic terror, so I would imagine that the period ahead for Australia will involve quite a painful and intense debate about where minorities sit in this country, how this country deals with the threat of extremism, and how this country deals with its minority groups,” freelance journalist Phil Mercer said. Mercer also told VOA from Sydney that the police response was swift once shots were heard inside the cafe. A police spokeswoman said the hostage-taker made contact during the standoff, but negotiators had not been able to establish a motive for his action. Monis, a self-proclaimed Muslim cleric, was facing charges including sexual assault and accessory to murder in separate cases. He was found guilty in 2012 of sending offensive and threatening letters to the families of Australian soldiers killed overseas, according to media reports. He had been sentenced to 300 hours of community service, the Sydney Morning Herald reported. Monis had obsessed over an ongoing legal battle over the letters, according to the Herald, which said a court on Friday refused to overturn charges against him. Local media reported that Monis had changed his name from Manteghi Bourjerdi. Early in the crisis, hostages were seen standing with their hands pushed up against the windows. A black flag with the Islamic creed known as the Shahada written in white could be seen through the glass. The phrase is a declaration of faith for Muslims and translates to “There is no God but Allah, and Muhammad is his messenger.” Radical Islamists, including the Islamic State group, have co-opted the Shahada to use on their flags. New South Police Commissioner Andrew Scipione on Monday refused to call the situation a terrorist act. But Prime Minister Tony Abbott said the incident at the cafe may have been politically motivated. The cafe is in the heart of Sydney’s financial and shopping district, an area packed with holiday shoppers at this time of the year. 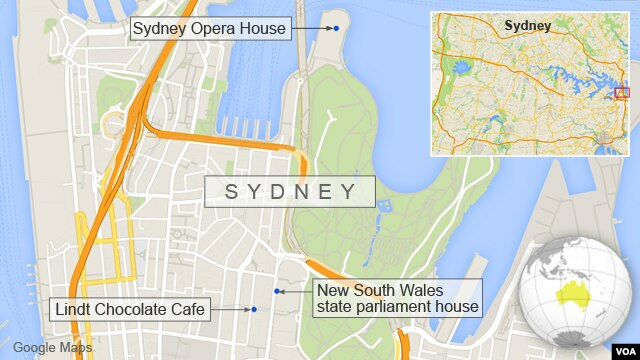 Nearby buildings, including the U.S. Consulate in Sydney, had been evacuated. U.S. State Department spokeswoman Jen Psaki said the department had monitored the situation and accounted for all its personnel with the mission. The New South Wales state parliament house is also just a few blocks away. Although Monis was well known to authorities, security experts said preventing attacks by people acting alone could still be difficult. “Today’s crisis throws into sharp relief the dangers of lone wolf terrorism,” said Cornell University law professor Jens David Ohlin, speaking in New York. “There are two areas of concern. The first is ISIS [Islamic State] fighters with foreign passports who return to their home countries to commit acts of terrorism,” Ohlin said. “The second is ISIS sympathizers radicalized on the internet who take it upon themselves to commit terrorist attacks to fulfill their radical ideology. “We are entering a new phase of terrorism that is far more dangerous, and more difficult to defeat, than al-Qaida ever was,” Ohlin said. Australia, a staunch ally of the United States and its escalating action against the Islamic State group in Syria and Iraq, earlier this year raised its domestic terror threat level from medium to high, mainly because of concerns about home-grown extremists. About 70 Australians are thought to be fighting for militant groups in the Middle East. In September, Australia’s largest counterterror raids took place in Sydney and Brisbane. One person was charged with terror offenses. Tough anti-terror laws were passed by the Australian parliament in October in response to the threat of homegrown extremism. Phil Mercer contributed to this report from Sydney. Some material for this report came from Reuters, AFP and AP.